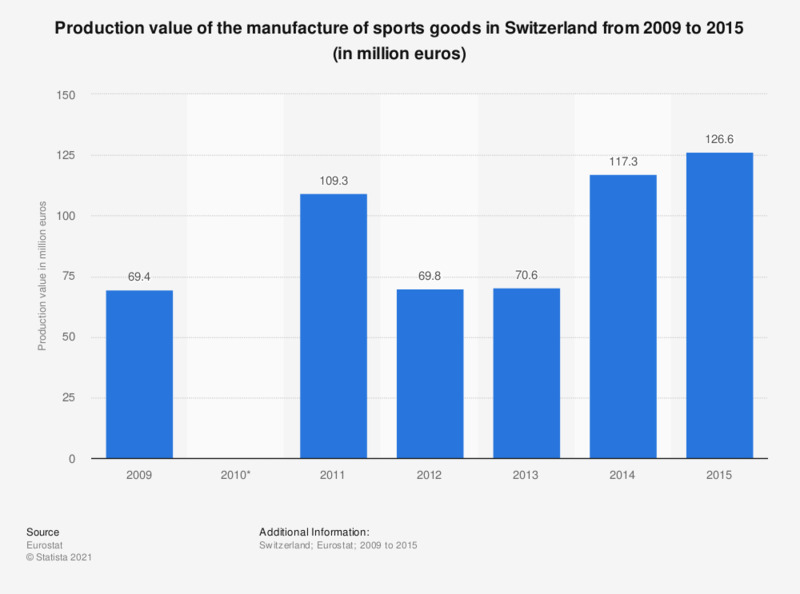 This statistic shows the annual production value of the manufacture of sports goods in Switzerland from 2009 to 2015. In 2015 the production value of sports goods manufacturing reached approximately 126.6 million euros. * Break in time series; low reliability. The source adds the following information:"Production value measures the amount actually produced by the unit, based on sales, including changes in stocks and the resale of goods and services. The production value is defined as turnover, plus or minus the changes in stocks of finished products, work in progress and goods and services purchased for resale, minus the purchases of goods and services for resale, plus capitalised production, plus other operating income (excluding subsidies). Income and expenditure classified as financial or extra-ordinary in company accounts is excluded from production value." Data coverage is for code C323 of the NACE_R2 of economic activities. Statistics on "Sporting goods in the United Kingdom (UK)"
When shopping for sporting goods, how often do you buy items online? Would you consider making all your purchases for sporting goods exclusively online? What ski equipment do you own?